The activity of the volcano remains elevated – magma is still standing high inside its conduits. The new cinder cone that has been built recently around the NE vent displayed mild and continuous lava spattering with intense lava glow at night, as well as strombolian explosions of small to moderate size (ejection heights racing from few tens of meters to approx. 150 m) at intervals of 10-20 minutes. The strongest explosions, however occurred from both the easternmost vent (below the more active NE cone, far right in the picture) as well as (and more frequently) from the westernmost vent, both ejecting incandescent material to certainly more than 200 m height and bombs reaching much of the crater terrace and its surroundings. Intervals of explosions were about one every 10-15 minutes vor the western vent and more rarely from the easternmost one (once per 30-40 minutes). As has been typical for the past decades, the westernmost vent usually generated significant amounts of ashes, while all other vents had almost no ash during their explosions. 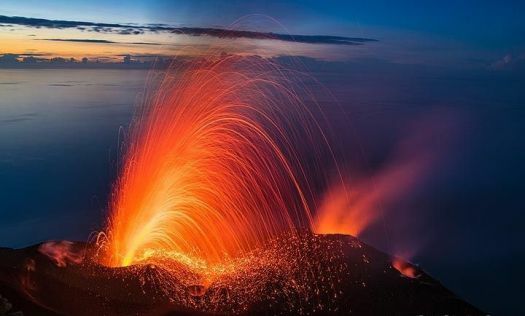 Some of the most notable eruptions, however, occurred from a vent in the NW area of the crater area: it forms a steep-sided, symmetric, conical shaped small cone and frequently erupted dense, candle-like lava fountains, as well as sometimes only mostly gas jets. Its eruptions were often accompanied by very loud detonation sounds. Occasionally, this vent also produced beautiful “smoke rings” (ring vortexes), apparently caused by pulsating gas emissions from its circular vent. A small vent just east of the mentioned westernmost vent also erupted in similar, but weaker style (narrow jets of lava) occasionally. Last, the formerly called “central crater”, in the southern central part of the crate terrace also had infrequent, typically small to moderately-sized classic strombolian eruptions. In the past this vent (located in the lower center of the image) often displayed constant glow and spattering, but did not do so today. All in all, explosions occurred at intervals of about 2-3 minutes from all 6 vents combined.